Introduce your child to the world of music and musical instruments. 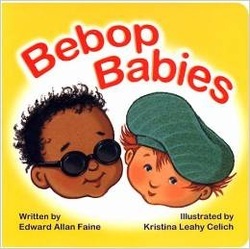 Bebop Babies is the first board book devoted exclusively to musical instruments. This book features cute babies emulating their idols Dizzy Gillespie (trumpet), Charlie Parker (saxophone), J. J. Johnson (trombone), Sarah Vaughan (singer), Milt Jackson (vibes), Kenny Clarke/Max Roach (drums) and many more!